Sever's disease is the most common cause of heel pain in children between 8 and 14 years old. It is also called calcaneal apophysitis (cal-ca-nee-al ap-o-fy-sigh-tis). It is more common in children who are very active, and who play sports that involve a lot running and jumping. 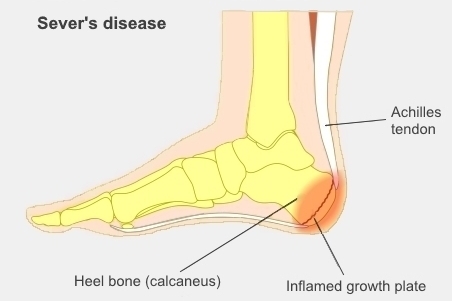 Sever's disease is related to the growth changes happening in the heel bone. Children with Sever's disease will recover completely with no long-term problems. Growth plates are areas of growing tissue near the ends of children's bones, where they make new bone tissue. Repeated stress on the heel from running and jumping can irritate the growth plate in a child's heel. a lot of running and jumping in bare feet or on hard surfaces. Children with Sever's disease feel pain at the back of their heel. It usually starts and builds up gradually, and often the child will limp and feel pain during or after activity. Their heel may also be painful first thing in the morning and get better as they move around. Sever's disease can affect one or both feet. The affected heel is usually tender, and squeezing the heel on both sides will cause pain. Sometimes the child's heel is swollen. Your child's GP, physiotherapist, or podiatrist will diagnose Sever's disease by examining their heel. They will probably not need any special tests or X-rays. Their symptoms will usually improve within weeks if they follow the advice below, but may take months to completely go away. Symptoms can also come back if the child does a lot of the activity that originally caused them. What can I and my child do? Applying ice to the affected heel can help to reduce swelling. Apply for 20 minutes after sports, or any time they are feeling pain. Do this every three to four hours until their symptoms go away. Make sure you wrap the ice in a cloth and don't apply it directly to the skin. Pain-relief medicines such as ibuprofen and paracetamol can help to minimise pain. Make sure your child doesn't take more than the recommended dose for their weight. Your child should cut down on or stop any activity that's causing the pain, and rest until the pain has gone. They can then go back to their normal activity, but rest again if the pain comes back. If the pain doesn't go away with rest, go back to their GP for further investigations. Calf stretches are very effective in reducing the pain of Sever's disease. Your child should stretch each calf for 30 seconds, three times a day (morning, night, and after exercise). They should also do 10 to 15 reps of the static isotonic hold, for 30 seconds each, three times a day. It's best to do this exercise on a step with a hand rail so they can pull themselves up with their arms and avoid using their calves until they are doing the exercise. have a slightly higher sole under the heel and thinner sole in the front of the foot. Raising the heel slightly reduces the strain on your child's heel. When children follow this advice, Sever's disease usually goes away and doesn't need any further treatment. Your GP can check to see what is causing your child's heel pain. If your child has tried all the steps above and isn't getting better, your GP can refer them to a podiatrist or physiotherapist. If their symptoms get worse with rest, it's important to see your child's GP, who may refer them to an orthopaedic surgeon to find out if something else is causing the pain. Very few children with Sever's disease need surgery. 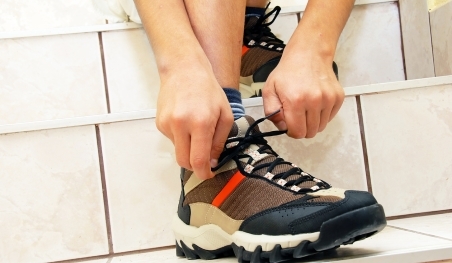 Your podiatrist will check their feet, legs, and the way they walk. They will also let you know which stretches, exercises, and footwear will help. They may also give your child heel raisers, shoe inserts, or orthotics, depending on how bad your child's pain is, their age, and foot shape. A physiotherapist can help by telling you what stretches will help. Often your podiatrist, physiotherapist, and GP will work together to get the best result. Written by HealthInfo clinical advisers. Endorsed by podiatry liaison, Canterbury DHB. Last reviewed August 2017.